The SEC charged State Street Bank and Trust Company (“State Street”) with conducting a pay to play fraud scheme. The SEC alleged that State Street conducted an illegal pay to play scheme in which one of its senior vice presidents paid bribes to a lobbyist to win contracts for the servicing of several Ohio pension funds. In the SEC’s Administrative Orders, it charged Vincent J. DeBaggis, a former Senior Vice President and Head of Public Funds at State Street, and Amer Ahmad, Deputy Treasurer of the State of Ohio, with carrying out the pay to play scheme. The Orders alleged that DeBaggis and Ahmad agreed to a series of illegal payments and political campaign contributions in exchange for State Street being granted a number of sub-custodian contracts awarded by the Office of the Treasurer of the State of Ohio. In 2010 and 2011, on behalf of State Street, DeBaggis paid $160,000 to Mohamed Noure Alo for supposed lobbying fees. Alo had no prior lobbying experience, but held himself out as someone who had connections to the Ohio Treasurer and Ahmad. The SEC alleged that a large portion of those fees were in fact kickbacks to Ahmad. According to the SEC, DeBaggis knew that Alo was acting on Ahmad’s instructions, and also that Alo was sharing his supposed lobbying fees with Ahmad as part of the pay to play scheme. Another State Street lobbyist, Robert B. Crowe, along with DeBaggis allegedly arranged for at least $60,000 in illicit political contributions to the Ohio Treasurer’s election campaign. Those payments were purportedly made to obtain and retain Ohio pension plan business for State Street. 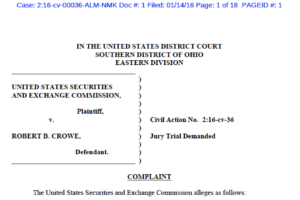 On the same day that the SEC entered its Administrative Orders against State Street and DeBaggis, it filed a Complaint against Crowe in the U.S. District Court for the Southern District of Ohio for Crowe’s role in the pay to play scheme. Our complaint alleges that Crowe served as a conduit for corrupt payments from State Street to influence decisions about public pension fund service contracts…. Pay-to-play schemes are intolerable, and lobbyists and their clients should understand that the SEC will be aggressive in holding participants accountable. The SEC explained that in exchange for the kickbacks and campaign contributions, Ahmad awarded sub-custody contracts to State Street for three of the four pension fund contracts that State Street bid on. Those contracts were for The State Teachers Retirement System of Ohio, the Ohio Public Employees Retirement System, and the Ohio Police & Fire Pension Fund. From 2010-2014, State Street earned over $30 million in direct fees from those three pension fund contracts. State Street also earned an additional $13.5 million in indirect revenue. Ahmad and Alo were criminally convicted of other crimes related to Ahmad’s tenure in office and were sentenced to federal prison.